Jalandhar: Three-Day state-level co-curricular academic competitions of Punjab School Education Board (PSEB) inaugurated today at four campus-venues of host Lovely Professional University.Stretched from today 17 competitive events will conclude on 28th November in which near 3000 students from 200 schools will participate. Director Academics (PSEB) Dr Amrita Gill was the Chief Guest of the day and Secretary (PSEB) Er Gurvinderpal Singh Bath was the Guest of Honour who inaugurated the competitions by lighting of the lamp. Thanking LPU for providing world-class university environ for the growing children of Punjab, Er Bath asked each participant to nourish competent thinking, competitive feel and policy to be a better human resource for the society. In another strong message he asked students, parents and teachers to join hands to abolish copying practice altogether, if there is any left . Impressed with successful hosting of four- time regional competitions, PSEB has entrusted LPU to further host state-competitions for first time. Er Bath honoured LPU Director General Er HR Singla for co-operation and co-ordination in organization of competitions. Er Singla assured PSEB authorities for all support in such future organizations. Deputy Director PSEB Mr Ram Lubhaya, DEO Kapurthala Mr Roop Lal, Programme co-ordinator S Harjinder Pal Singh were also present on the occasion. On the inaugural day, winner students of Category-I (Class I to V) from four regions-Jalandhar, Amritsar, Bathinda & SAS Nagar competed. 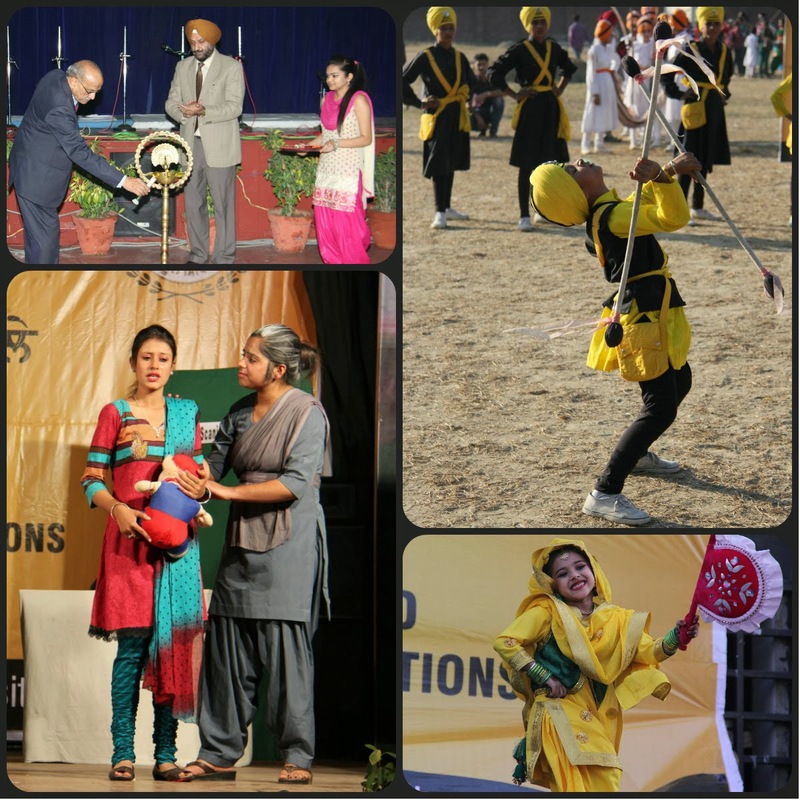 These students performed for Shabad Gayan, Declamation, Painting, Calligraphy, Folk Songs, Solo Dances; whereas, senior boys & girls displayed their worth through mesmerizing Gattka and One Act Plays. Direct entries in category-III (Class IX to XII) to Sammi Dance & Gattka for Girls and Malwai Giddha for boys have been introduced for the first time. Gattka by girls attracted all the on-lookers and reminded them about the heroic culture of Punjab which is equally contributed by women. Stretched from today these 17 competitive events will conclude on 28th November in which near 3000 students from 200 schools will participate. Women Gatka participants Sukhveer, Vanita & Manpreet from Sant Waryam Singh Memorial Public Sr Sec school Mohali revealed their excitement in displaying bravery of Punjab. They said: “It is indeed great that we have got a great chance to perform before the spectators of the largest University of India. We have been inspired, and have developed a great confidence within ourselves.” Illustrative, held annually at Block, District, Regional and State Level in chronological order; these co-curricular PSEB activities have due Academic Weight-age for the participants. These competitions help the participants in having reservation of seats for all academic and professional courses at university as well as school Levels, as per their talent potentialities. Results of Today’s events are – In Calligraphy competition Sumit Kaur stood first (Guru Amardas Sr. Sec School, Goindwal Sahib), Sandeep Kumar stood second position (Primary School, Patra, Patiala) and Jaspinder Kaur stood third position (Sri Guru Amar Das Sr Sec School, Kapurthala). In Shabd Gayan competition Aashma stood first position, Krishinder Kaur stood second and Jaspreet stood third position. In Solo Dance competition Diljit Mann Singh stood first position (S D Public School,Batala) Navjeet Kaur stood second position (Sr Sec Model School, Patiala) and Jaspreet Kaur stood third position (Doaba Khalsa Model Sr Sec School, Jalandhar). In Declamation competition Lovepreet Kalra stood first position (S N Public Sr Sec School, Ludhiana), Rajwinder Kaur stood second position (Dr Asha Nand Arya Sr Sec School, Nawashahr) and Komalpreet Kaur stood third position (Central Public Sr Sec School, Ghumann). check it out all latest collection of quotes in hindi find out here. You have collected quite interesting resources. I like this list. By the way, I want to recommend you a very helphul site with a lot of great tools for copywriters, freelancers, recruits etc - https://www.contrib.com. مكافحة الحشرات من الأشياء الواجب فعلها علي اتم وجه حتي نتجنب الامراض و الأوبه التي تسببها الحشرات . و لحل مثل هذه المشكله لابد من اللجوء الي الشركات ذوي الخبره ، علي أن تكون متميزه في مكافحة الحشرات و طرق القضاء عليها . و مما لا شك فيه أن أفضل شركة بالدمام هي شركة ديكوريند لمكافحة الحشرات . لما تقدمه الشركه من خدمات و طرق فعاله للقضاء علي الحشرات بجميع أنواعها . الشركه تعتمد علي العماله المدربه جيدا ، و المبيدات و الأجهزه الفعاله في القضاء علي مثل هذه الآفات الضاره. نتيجة لارتفاع درجة الحراره و نسبه الرطوبة في الدول العربيه ، تنتشر و تكثر الحشرات في كثير من المناطق و خاصة التي تطل علي المسطحات المائيه . تؤدي تلك الآفات الضاره الي اصابه قاطني المنزل بالأمراض و شعورهم بعدم الراحه ، و تقوم أيضا بإتلاف المنتجات الغذائيه و الاثاث و الملابس . و لتنجب مثل هذه المشاكل و الأمراض و الأوبئه و المخاطر التي قد تصيب أطفالنا الصغار ، يجب القضاء علي مثل هذه الحشرات تماما و ذلك بالاستعانه بذوي الخبره . شركة ديكوريند تتمتع بالخبره الكافيه للقضاء علي الحشرات بجميع أنواعها و أشكالها بإستخدام المعدات الجيده و العماله المدربه و المبيدات المتميزه . مما لاشك فيه أن أسعار شركة ديكوريند لا تقبل المنافسه اطلاقا ، لما تقدمه الشركه من خدمات جيده جدا في مقابل الأسعار التي تكون في متناول الجميع . و تسعي الشركه دائما إلي تقديم أرقي و أفضل الخدمات ، التي ترضي جميع عملائنا الكرام ، فلا تتردد في الاتصال بنا . Quality services are always the priority of everyone's choice when offering or getting services. The struggle is emphasized to make sure things go as planned. Quality plans laid are determined by the level of professionalism. Get with experts who will ease your research work on our site. Consult us for citation audit services which will definitely be your best moment of experience. Gain a lot by working with us.